Five years ago we launched Hands Across Niagara, a shared annual appeal with the Anglican Church of Canada. Since its inception many creative justice and servant ministry initiatives have been supported at all levels of our church through the incredible generosity of Anglicans in Niagara. Going forward, we have made the decision to channel the resources of Hands Across Niagara towards the national church’s annual appeal called “Giving with Grace”, formerly known as the Anglican Appeal. We do so for an important reason: the Anglican Healing Fund is coming to the end of the resources generously provided for its work. In response Giving with Grace seeks to replenish its funds to help us continue to foster community-based healing projects. The Bishop and Primate invite you to redirect your Hands Across Niagara contribution to this important Giving with Grace annual appeal. Learn more about Giving with Grace here. In partnership with the Ellen Osler Home, a Salvation Army residence that supports women re-integrating into society after a conviction, members of St. James' are engaging their neighbourhood to build bridges of trust and hope in the community of Dundas. Residents, staff, and volunteers from the Ellen Osler Home are sharing the experiences of residents through a series of small gatherings intended to raise awareness and breakdown stigmas. 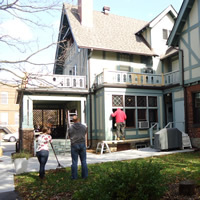 Sessions include a symbolic action: participants are asked to contribute to the cost of replacing windows in the Ellen Osler Home. The "windows on injustice" portion of the project invites members of the community to make a commitment to integrating these women into a more just and hopeful society. Working with the Social Justice Group of Centre Wellington and collaborating with a sizable number of community organizations, St. James' is compiling a document related to best-practices for food centers. In this work they are gathering input from community members who seek food assistance, and then developing common goals, terms of reference, and an accountability process for agencies providing food assistance in the region of Centre Wellington. Further, St. James and the Social Justice Group is seeking broad input, through social media and community meetings, as part of the process of applying for a major grant to support their work in the region. Working with Front Line Outreach in North Oakville, members of Church of the Incarnation engaged marginalized members of their community through new community gardens. The Hands Across Niagara grant enabled the partners to hire a part-time staff member to invite residents of a nearby subsidized housing project to be involved in key decisions around what to plant and how to use the food grown in the gardens planted at the church. Beyond the learning associated with growing healthy produce, participants worked to address the root causes of food insecurity while building ties within the community. 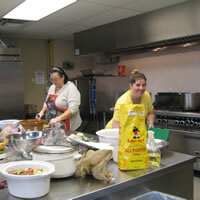 Partnering with Community Care, members of St. John's are hosting a monthly community kitchen. 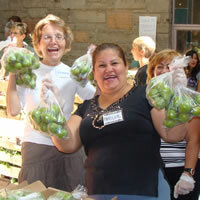 In a supportive environment, participants are building relationships with parishioners while learning cooking techniques and preparing three different meals to take home with them. The project empowers participants as they learn cooking skills, as they talk together about sources for nourishing food, and as they grow together in relationships with an eye towards future advocacy and organizing initiatives. 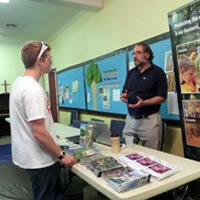 On Saturday, September 19th, St. John's and their partner, A Rocha, hosted an Environmental Awareness Day. Targeting local families, the event featured information about practical steps we can all take to safeguard the health and integrity of natural world. One of the guest speakers shared the latest science on the impact of neonicotinoids in the environment – a critical concern for local agriculture. The event included electronics recycling, so that harmful components of our electronic devices will not end up in landfills. 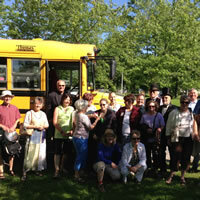 Participants were invited to become part of environmental action groups that meet regularly through the year. 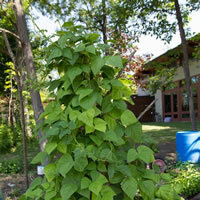 Grace Church in St. Catharines is promoting environmental justice through the community gardens they are cultivating in partnership with the YWCA, Greening Niagara, RAFT and neighbouring congregations. This project has grown out of a visioning process undertaken by the congregation and Grace and is aligned with the church's sense of mission. 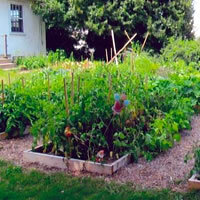 The gardens not only provided fresh organic produce to the community gardeners and organizations involved, but it became a catalyst for building relationships within their neighbourhood. Through education, advocacy and hands-on experience the congregation's awareness of food security and sustainability issues grew and they are poised to continue their community development work to respond to them. 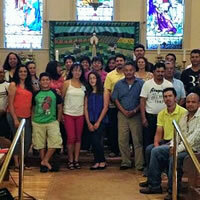 St. Alban's in Beamsville is offering support, community and education to the largely Spanish-speaking group of temporary workers employed at farms around Beamsville. St. Alban's offered up to 60 people each week a spiritual home; a place to worship in their native language, a social setting to ease isolation, and support with translation and interpretation. The project also offered opportunities to communicate with family in Mexico and ESL classes in partnership with the Believer's Bookshelf in Beamsville. Through the project, St. Alban's also built partnerships with community groups like AIDS Niagara, Quest Community Health Centre, AWA (Agriculture workers alliance), Niagara Migrant Workers Interest Group (NMWIG) and the Centre for Spanish-speaking peoples. St. Luke's in Burlington, in partnership with Refresh Foods and three local congregations, is hosting a Downtown Community Lunch with a particular emphasis on engaging people who may be living on a low income, newcomers to Canada, and seniors. The partners are using the meal to foster community, out of which will grow the ability to equip their guests for self-advocacy. The community which develops around the meal will support one another as they take steps to improve their own situation. Already, a movement to advocate for transit service to be restored in the downtown was sparked by concerns raised by lunch guests, and has spread through the congregation at St. Luke's, and beyond. Partnering with the Guelph Chapter of the Council of Canadians and members of the Aamjiwnaang First Nation, members of St. James in Fergus presented a provocative film series addressing themes of eco-justice while inviting conversations about reconciliation with First Nations groups. The films addressed health concerns faced by children because of toxic chemicals in the environment, depicting the experience of First Nations living in the so-called chemical alley near Sarnia. The series considered issues raised through the Idle No More movement, and inspired engagement with local environmental groups on water and watershed issues. They subsequently presented a petition signed by over 100 people to their Member of Parliament. Because of our generosity in supporting Hands Across Niagara, the Anglican Church of Canada is able to fund the salaries of two seminary instructors in Matanzas, Cuba. We are investing in the leadership of the present and future so that Anglicans in our partner Diocese will have improved capacity to engage God's mission in their own context. 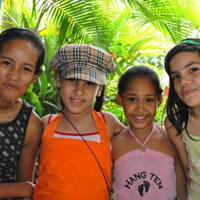 Our investment in Cuba goes beyond clerical leadership. Hands Across Niagara also makes it possible for the Anglican Church of Canada to make grants to the music camp that engages children and youth in learning and leadership through the gift of music. 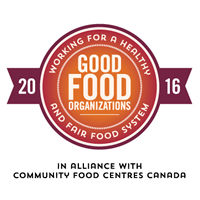 Partnering with Food for Life and Community Development Halton, is using a Hands Across Niagara Grant to establish the Halton Food Network. This gathering of church groups and community organizations engaged in offering community meals will work together to identify best practices in community dining. Working with skilled facilitators, the group will also address questions such as how best to promote dignity while empowering lunch and dinner guests towards self-advocacy in their social networks. Drawing from a broad base of first-hand experience and expertise, this diverse group will also engage root-cause questions like why so many people are hungry in a relatively affluent region of Southern Ontario. Together with Food for Life, Open Doors at St. Christopher's has launched a monthly lunch for seniors. In addition to offering nutritious meals, the goal of this lunch will be to address the isolation faced by many seniors. Volunteers will be trained to support guests, and speakers will seek to empower guests with skills for resiliency and self-advocacy. 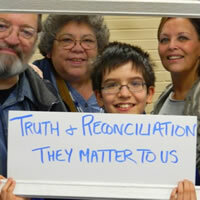 Canada is not the only region engaged in a truth and reconciliation process. The Anglican Consultative Council 15 in Aotearoa New Zealand in October 2012 asked the Anglican Peace and Justice Network to conduct a survey of all Anglican provinces engaged in THR so that best practices can be shared. A conference will follow the completion of this process to gather global Anglicans engaged locally in Truth, Healing and Reconciliation processes. The Anglican Church of Canada will not only participate, but offer to host and contribute financial resources to the costs of participants travelling great distances from Provinces and dioceses without sufficient funds to send representatives. Your support through Hands Across Niagara will be an important component of the success of this significant event. 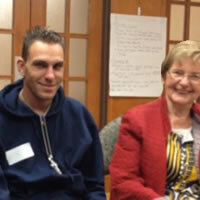 Working with the Social Justice Group of Centre Wellington, is launching two programs to empower their neighbours living in poverty to create opportunities for inclusion. Through conversations and consensus-based decision making, volunteers from St. James will involve community members and local growers in key decisions about expanding the programs offered by the Food Bank. Their goal is to transform the Food Bank into a Community Food Centre where the community is shaping the goals and the operation of the centre. The partnership is also supporting a plan to engage previously unemployed youth to cook and serve food at an Elora restaurant. Underlying both projects is a commitment to train volunteers engaged in a number of related community organizations with the successful "Bridges out of Poverty" program, adapted for use in Canada.